Stitcher is a platform with access to more than 100,000 podcasts. For those who want to listen to Stitcher Podcasts anytime, anywhere, this tutorial will share the easiest way to download Stitcher Podcasts to your phone or PC. Let’s take a look at it. In addition, the following software will help you a lot. Do You Want to Download Stitcher Podcasts? 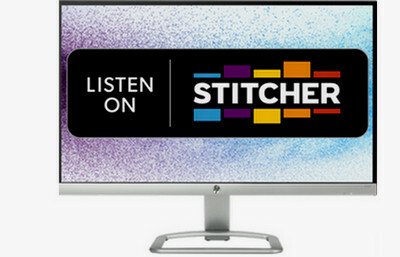 Stitcher is a podcasts platform focuses on news and information radio and podcasts. You can listen to online streaming podcasts on your various devices or free. Sometimes, you may want to download your favorite podcasts, episodes or shows for offline playback, especially in travel or no-network environments. Then, you have come to the right place. Next, I will show you how to make Stitcher download podcasts on your mobile phone and computer with ease. 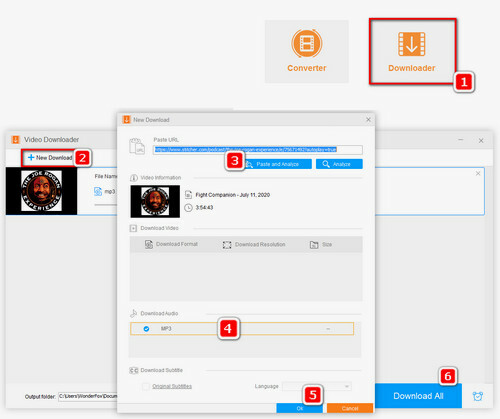 Yes, in order to make Stitcher podcast download a simple task, WonderFox Free HD Video Converter Factory will provide you with a very simple solution. The software supports downloading the video or audio you want from a large number of audio and video sharing stations including Stitcher podcasts, YouTube, Facebook, etc. Just have a try! Step 1. Open the Stitcher app and find the episode you want to download. Step 2. Tap episode thumbnail and an information panel will pop up. Step 3. Swipe down to select Download Episode. Step 4. Click the three horizontal buttons in the upper left corner and select Downloads to see the downloaded episodes. In addition, in the Downloads window, click the three-point icon in the upper right corner and select Download Settings to customize download settings, such as Set ON to automatically download new episodes in a playlist, Wi-Fi Downloading Only, etc. At the same time, you can also clean up the downloaded podcasts or change storage location. It is worth mentioning that, Stitcher doesn't support downloading episode files for playing on other players and devices. On the mobile app, you can download, but you can only play your downloads within the Stitcher app. For Stitcher download on PC, Stitcher podcasts downloader is a must and WonderFox Free HD Video Converter Factory is a very popular audio and video downloader. We used this program to download YouTube videos, VK music and even download Twitch VODs, etc. All in all, this is a very friendly download tool that makes it easy to download Stitcher podcasts. Now, free downloadfree download it to start the tutorial. For downloading Stitcher podcast offline, first of all, you need to visit https://www.stitcher.com/ and find the episode you want to download. Play the Stitcher podcast and copy its URL. Now, free downloadfree download and install WonderFox Free HD Video Converter Factory on your PC. Launch the program you just installed and click on Download Video button on the menu bar. Paste URL into Add URL box. Click on Analyze button to get the podcast information. Set the output path for your Stitcher podcast file and click on Download button to finish the whole process. In this way, you can download your favorite Stitcher Podcast to MP3 for playback on any device, anytime, anywhere. WonderFox never advocates any illegal downloads, please make sure your actions are legal in your country. In addition, downloaded files should not be used for any commercial activities. 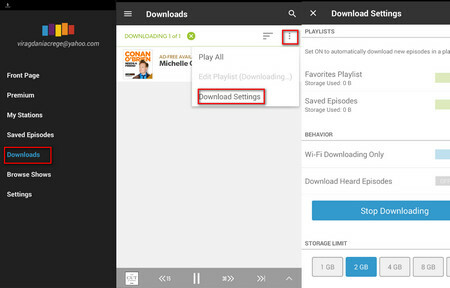 These are two common ways to download Stitcher podcasts to your phone or PC. Then, you can enjoy podcasts anytime, anywhere, even without a network. 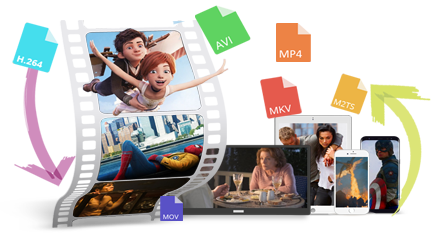 In addition, WonderFox Free HD Video Converter Factory can also enable you to increase the volume of MP3, adjust the bit rate of MP3, and so on. Download to experience it! In general, downloaded Stitcher podcasts are saved in MP3 format. Sometimes we will want to convert downloaded files to other audio formats such as AAC, AC3, WMA and more. Then HD Video Converter Factory Pro can be our best choice because it can convert podcasts to other formats in batches to save us time and manual operations. Just have a try!